In this lesson, we will learn how to solve real-world problems using trigonometric functions in right triangles. A footballer kicks a ball into a goal post. The angle of elevation between the trajectory of the ball and the pitch is 3 8 ∘ . 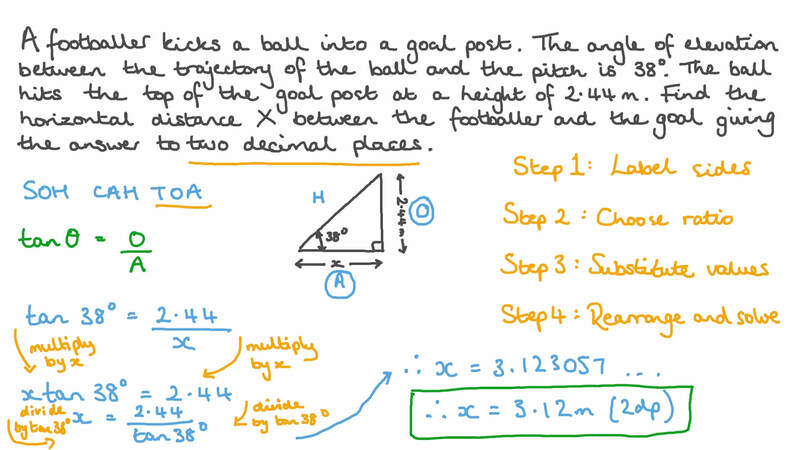 The ball hits the top of the goal post at a height of 2.44 m. Find the horizontal distance 𝑋 between the footballer and the goal giving the answer to two decimal places. 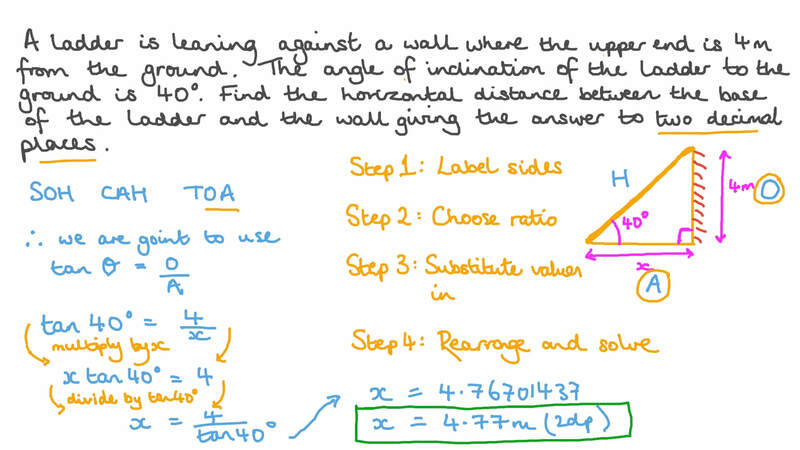 Calculate the size of the angle of elevation of the top of a 10 m high building from a point on the ground 8 m from its base, giving the answer to two decimal places. 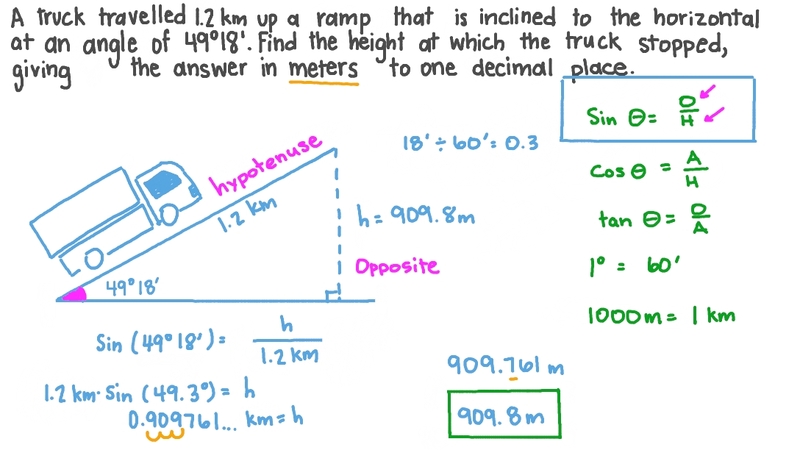 A truck travelled 1.5 km up a ramp which is inclined to the horizontal at an angle of 5 8 ∘ . Find the height at which the truck stopped giving the answer in metres to one decimal place. A ladder is leaning against a wall where the upper end is 4 m from the ground. The angle of inclination of the ladder to the ground is 4 0 ∘ . Find the horizontal distance between the base of the ladder and the wall giving the answer to two decimal places. The angle of elevation from a point 221 m away from the base of a minaret is 4 4 4 8 ′ ∘ . Find the angle of elevation, to the nearest minute, if the point is now 202 m away from the base. A 175 cm tall man was standing on the ground 14 m away from a tree. The angle of elevation to the top of the tree was 3 4 4 8 ′ ∘ . Find the height of the tree giving the answer to two decimal places. A lamp post 7.6 metres tall casts a 1.8 metres shadow. Find the angle of inclination of the sun giving the answer to the nearest minute. A man observed a stationary car from the top of a building. The car is on the same horizontal plane as the base of the building and 59 metres away. The angle of depression from the man to the car is 6 3 ∘ . Find the height of the building giving the answer to one decimal place. The angle of elevation of the top of a building in New York from a point on the ground 2 miles from the base of the building is 2 ∘ . Find the height of the building in feet. Note that one mile is equal to 5 280 feet. The height of a giant redwood tree is known to be 370 feet. The angle of elevation from a point on horizontal ground to the top of the tree is 6 0 ∘ . Assuming that the tree grows vertically, how far from the base of the tree is the point from which the angle was measured? A point on the ground is 32 metres away from the base of a house. The angle of elevation from the point to the roof of the house is 3 3 4 8 ′ ∘ and the angle of elevation from the point to the top of the chimney is 3 8 3 6 ′ ∘ . Find the height of the chimney giving the answer to two decimal places. A tower is 73 metres tall. A man observed the tower from a point and the angle of elevation was 3 6 ∘ . He then walked a horizontal distance of 𝑋 metres towards the tower and the angle of elevation was 5 9 3 0 ′ ∘ . Find the value of 𝑋 giving the answer to one decimal place. The angle of elevation 64 metres away from the base of a minaret is 3 3 4 8 ′ ∘ . Find the angle of elevation 6 metres away from the base of the minaret to the top of the minaret giving the answer to the nearest minute. Assuming that a 370-foot tall giant redwood grows vertically, if a man walks a certain distance from the tree and measures the angle of elevation to the top of the tree to be 6 0 ∘ , how far is the man from the base of the tree? The angle of elevation of the top of a New York building from a point on the ground one mile from the building is 9 ∘ . Find, in feet, the height of the building knowing that 1 mile = 5 2 8 0 feet. Give your answer to the nearest foot. A man was standing 25 m away from the base of a tower with a flagpole at the top. He measured the angles of elevation of the top and the base of the flagpole to be 4 0 ∘ and 2 3 ∘ respectively. Find the height of the flagpole accurate to two decimal places. A climber is stranded on a cliff face. A rescue team leaves immediately from their base, which is at an altitude of 1 mile, and heads directly towards the climber. When the team left the base the angle of elevation from them to the climber was 1 5 ∘ . After walking for 0.5 miles on flat ground directly towards the stranded climber, the angle of elevation was 2 2 ∘ . What is the altitude of the climber in miles? Round your answer to one decimal place. The distance between two control towers, 𝐴 and 𝐵 at an airport is 2‎ ‎408 metres. The angles of elevation from the 𝐴 and 𝐵 to an aeroplane are 5 4 6 ′ ∘ and 4 9 ∘ respectively. Find the altitude of the plane giving the answer to the nearest metre. Two students wanted to estimate the height of a building. They measured the angle of elevation of the top of the building from a point on the ground to be 3 9 ∘ . They moved 300 feet closer to the building and measured the angle of elevation of the top of the building to be 5 0 ∘ . They assumed the street to be level and used their results to calculate an estimate for the height of the building. What was their estimate to the nearest foot? A man and a woman standing 3 1 2 miles apart spot a hot air balloon at the same time. If the angle of elevation from the man to the balloon is 2 7 ∘ , and the angle of elevation from the woman to the balloon is 4 1 ∘ , find the altitude of the balloon to the nearest foot. A person measured the angle of elevation of a fixed hot air balloon as 𝜋 7 . He then walked 522 m in a horizontal direction towards the balloon and the angle of elevation was 𝜋 4 . Find the height of the hot air balloon to the nearest metre. A pole leans away from the sun at an angle of 7 ∘ to the vertical, as shown in the given figure. When the elevation of the sun is 5 5 ∘ , the pole casts a shadow 42 feet long on the level ground. How long is the pole? Round the answer to the nearest tenth. Two students wanted to estimate the height of a building. They measured the angle of elevation of the top of the building from a point on the ground to be 3 5 ∘ . They moved 250 feet closer to the building and measured the angle of elevation of the top of the building to be 5 3 ∘ . They assumed the street to be level and used their results to calculate an estimate for the height of the building. What was their estimate to the nearest foot? Two men are standing 685 metres apart on a horizontal field watching a fixed hot-air balloon. The angle of elevation of the first man to the top of the balloon is 4 5 ∘ and the angle of elevation of the second man to the top of the balloon is 2 7 ∘ . Find the vertical height of the balloon from the ground giving the answer to the nearest metre knowing that the projection of the ballon lies between the two men. A helicopter is moving vertically with a uniform velocity of 96 m/min. The angle of elevation from point 𝐴 on the ground is 2 4 ∘ and 3 minutes later becomes 8 ∘ . Find the distance between 𝐴 and the helicopter giving the answer to the nearest metre.